Days of Remembrance observance memorializes lost It was so quiet in the Main Post Chapel one could hear a pin drop as community members took part in a moment of silence, reflecting on the millions of lives lost during the Holocaust, at the installation’s Days of Remembrance Ceremony May 5. Chaplain (Capt.) 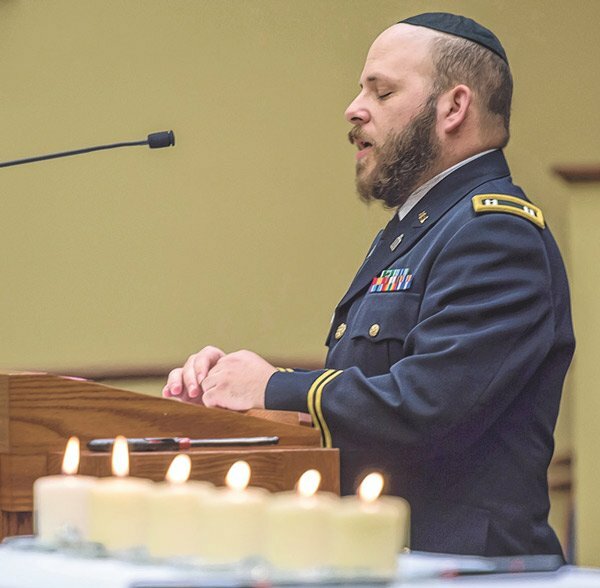 Menachem Stern, Fort Leonard Wood’s Jewish rabbi, led the community in that quiet moment, prior to offering a memorial prayer. The ceremony was personal to Stern, whose Family lost several members during this period in history. Stern said the scale of devestation from the Holocaust is overwhelming. “On Sept. 11th, 2001, 3,000 people died in the attacks on the World Trade Center and the Pentagon, the worst terrorist incident in American history. During the Holocaust, on average, 3,000 Jews were murdered, every day, for five and a half years. If we were to observe a minute of silence for each of those victims, the silence would last more than 11 years,” Stern said. “One such man is Mr. Nicholas Winston, who organized the Kinder Transport, with which my grandmother was saved. Mr. Winston was not Jewish, and he could have observed the war from afar, however in his own words, the motto ‘don’t be content in your life just to do no wrong. Be prepared every day to do good,’” Stern said led him to act. Stern encouraged the audience to remember the past and strive to make sure past mistakes are not repeated. Although on a smaller scale, he said discrimination and persecution could be seen “again and again” on television and in the news. “We have to work at building bridges across the void that might otherwise separate people of different races and faiths. Creating communities, like our extraordinary community here, where we celebrate diversity instead of feeling threatened by it, where we recognize the dignity of difference, where we understand that one who is not in my image is still in God’s image, even if his color is not mine, or culture is not mine, even if his religion is not mine,” Stern continued. “We cannot change the past, but the survivors have shown us out of the wreckage of destruction, something can be redeemed from the past if we fight hate with love, brutality with compassion, and death with an unconquerable dedication to life,” he said. Following Stern’s speech, the audience watched the documentary “The Path to the Holocaust.” The program educated attendants about the rise of the Nazi party and how the Holocaust came to pass. Closing the ceremony, Command Sgt. Maj. Alma Zeladaparedes, Maneuver Support Center of Excellence Noncommissioned Officers Academy command sergeant major and host for the event, thanked Stern for his presentation and encouraged everyone to learn lessons from the past.